The Holidays are right around the corner and in typical Smarty Style, we are going to keep you updated on all the Holiday Happenings that are taking place in Charlotte. Saturday, November 17th Tree Lighting Ceremony & Santa Arrival at the Blakeney Shopping Center. 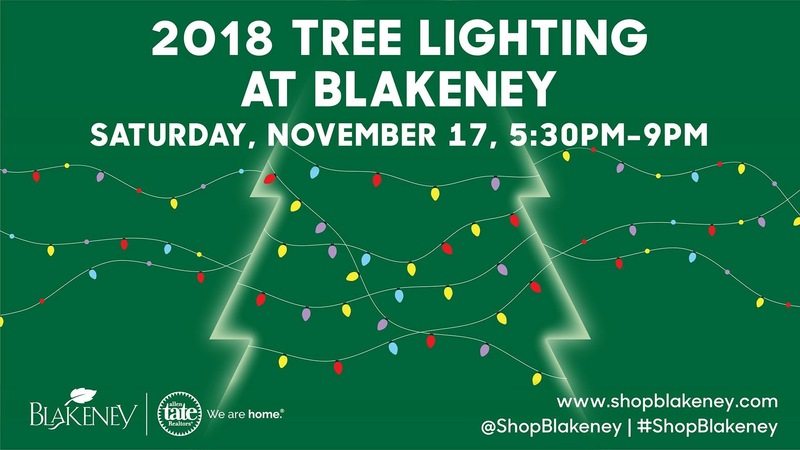 The Blakeney Shopping Center is kicking off the holiday season with their annual Santa arrival and Tree Lighting Ceremony set for Saturday November 17th from 5:30 to 9pm. Santa Claus will be arriving in style, greeting children and stopping for photos at his new workshop following the official Tree Lighting ceremony presented by Allen Tate Realtors. The evening will be full of holiday activities including arts and crafts, visits from Holiday Characters, music by the Matt Stratford Band and so much more! 107.9 The Link will be on-site, providing the Christmas jams and jingles. Come early to dine and socialize with friends and neighbors and be sure to take advantage of special offers from select Blakeney retailers and restaurants throughout the event. This event will also mark the official opening of Santa’s workshop, sponsored by Passionate Paws Animal Hospital. 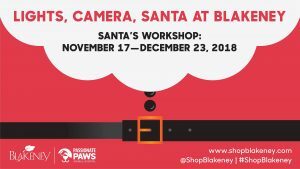 This year, Blakeney Shopping Center is debuting a brand new, custom built workshop for our Santa Photo Experience, located on the Village Green between bluemercury and KILA Boutique. Starting November 17 and running through December 23 stop by to have your portrait taken with Santa Claus. *Guests can find an updated overview of the Santa Photo Experience , including hours of operation on the Blakeney website. For those sad about leaving their four-legged friends at home during the holiday cheer, Santa’s Workshop will host two pet-friendly Paws & Claus Saturdays on December 8 and 15 from 12:30 to 3:30 p.m. Don’t worry, humans are still welcome during these two dates! Located at Rea Road & Ardrey Kell Roads in South Charlotte, Blakeney has endless shopping and dining options for fun and entertainment!